Longer. Deeper. And flat at the bottom. Unfortunately that describes the 2007 employment recession. 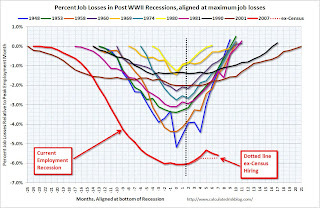 This graph shows the job losses from the start of the employment recession, in percentage terms - this time aligned at the bottom of the recession (Both the 1991 and 2001 recessions were flat at the bottom, so the choice was a little arbitrary). The dotted line shows the impact of Census hiring. In July, there were 196,000 temporary 2010 Census workers on the payroll. The number of Census workers will continue to decline - and the gap between the solid and dashed red lines will be gone in a few months. The Employment-Population ratio decreased to 58.4% in July from 58.5% in June. 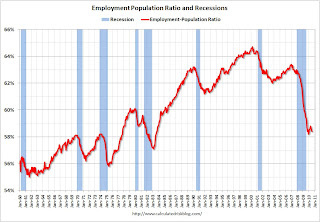 This had been increasing after plunging since the start of the recession, and the recovery in the Employment-Population ratio was considered a good sign - but the ratio has now decreased for three consecutive months. This graph shows the employment-population ratio; this is the ratio of employed Americans to the adult population. Note: the graph doesn't start at zero to better show the change. The Labor Force Participation Rate decreased to 64.6% from 64.7% in June. This is the percentage of the working age population in the labor force. This decline is very disappointing, and the rate is well below the 66% to 67% rate that was normal over the last 20 years. The reason the unemployment rate was steady at 9.5% was because people left the workforce - and that is not good news. As the employment picture improves, people will return to the labor force, and that will put upward pressure on the unemployment rate. 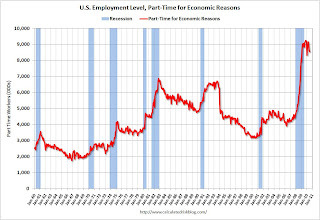 The number of persons employed part time for economic reasons (sometimes referred to as involuntary part-time workers) was essentially unchanged over the month at 8.5 million but has declined by 623,000 since April. These individuals were working part time because their hours had been cut back or because they were unable to find a full-time job. The number of workers only able to find part time jobs (or have had their hours cut for economic reasons) was at 8.53 million in July. This small decline was a little bit of good news. The all time record of 9.24 million was set in October 2009. These workers are included in the alternate measure of labor underutilization (U-6) that was steady at 16.5% in July. According to the BLS, there are 6.,572 million workers who have been unemployed for more than 26 weeks and still want a job. This is 4.3% of the civilian workforce, just below the record set last month. (note: records started in 1948). 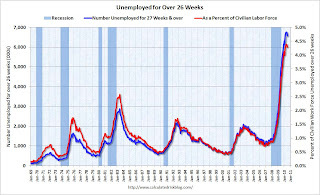 The number of long term unemployed might have peaked ... perhaps because people are giving up. The underlying details of the employment report were mixed. The positives: a slgiht increase in hours worked and in hourly wages, and the slight decreases in part time workers (for economic reasons) and in the long term unemployed. The negatives include the weak hiring of only 12,000 ex-Census, the declines in the participation rate and employment-population rate, and the significant downward revision to the June employment report. Overall this was a weak report. July Employment Report: 12K Jobs ex-Census, 9.5% Unemployment Rate for graphs of unemployment rate and a comparison to previous recessions.